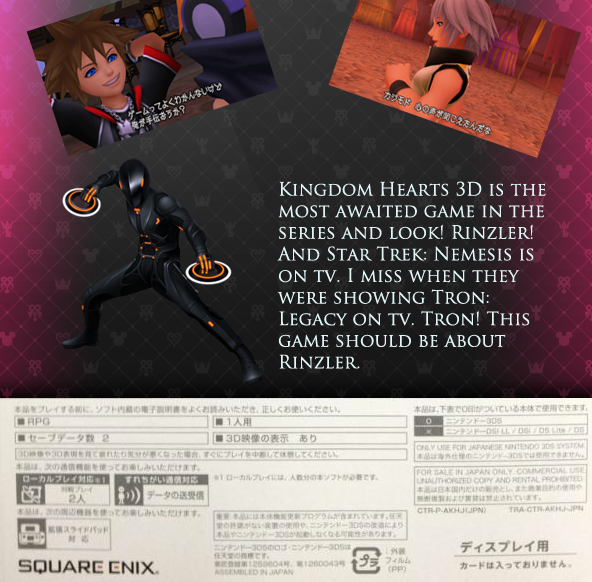 Kingdom Hearts 3D Back-of-the-Box Contest! Oh no! Not another contest! Don't know how to draw a femur? So what! Can't write a brilliant piece of prose that uses stream of consciousness to show off one's beliefs on metaphysics and love? Haha, neither can I! All you need for this contest is your wits and a computer with some kind of image editing program on it! Don't have an image editing program? This free site will do everything an image editing program can! 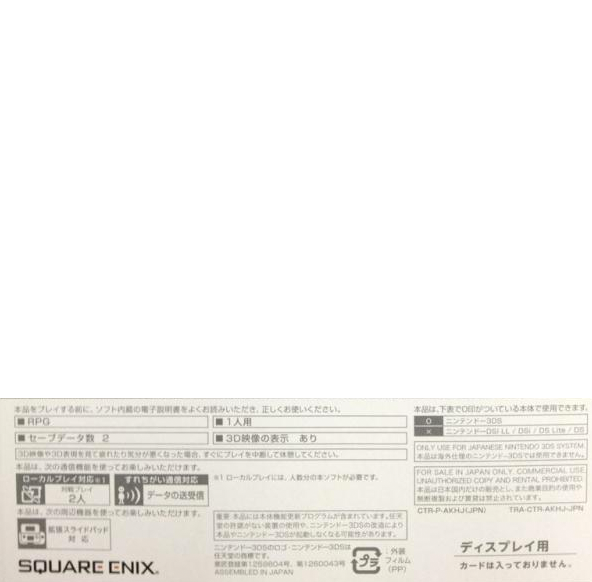 All you have to do is design the back of the Kingdom Hearts 3D box how you think it should look and what things it might say. It's that simple! You can make it as silly as you want to, or as legitimate as you can imagine! We prefer if you use screenshots and character renders (accessible from our gallery) but you may also draw if you wish! All forum rules apply to this contest! Size of the entry cannot be over 700x700 and one entry per person! All entries are due Friday, March 23rd 2012 at 11:59pm PST to me, Master Spockanort via Private Message. Voting will occur via poll from Saturday, March 24th to Tuesday, March 27th! The winner will be announced Wednesday, March 28th, the anniversary date of the Kingdom Hearts series! The winner will get a really awesome prize (it's a surprise!) and their back-of-the-box featured on our site and social networks, so send in all of your entries! Also if you have any questions please ask them here! Do you have a size preference for the back cover to be? Apple Jaxx wins. It's done. Go home everybody! Kingdom Hearts 3D: Now with Hats! In all seriousness, though, do we have to use that specific template? No, you don't! It's just there if you need one. I've never sent an image through a private message before. How exactly do I do it? What font do the pictures use? In the screenshots? Or our examples? If I'm not mistaken the screenshots use a special font made by SE, but I'm probably wrong. My example used Trojan. I also tend to use Baskerville. You can use whatever font you want, though. 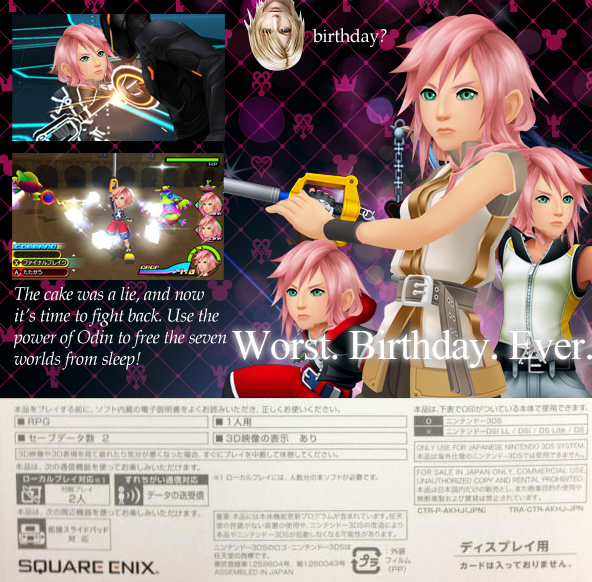 Oh my god, I love this so much xD My favorite part is probably random Aya excited about Birthdays. Can I participate in this event? I'm new, but I would like to jump right into the action, if I can. Exactly right! This contest it open to everyone, so feel free to just jump on in!